In 1823, little more than a decade after the War of 1812 in which the U.S. fought for its free use of the seas, President James Monroe issued a foreign policy statement which was to affect the development of the Western Hemisphere for the next century. This Monroe Doctrine expressed in no uncertain terms that the U.S. would not tolerate European interference, control or influence in North and South America. It was a time when the U.S. was feeling its political and economic "oats." The United States Mint was gearing up to exercise its technological "muscle" also. William Kneass came aboard as Chief Engraver in January of 1824, and Samuel Moore as Mint Director later that year. Both men were charged with the task of increasing output and uniformity. To this end, in 1828 Kneass instituted a new process; minting coins within a close, reeded collar to standardize diameters, thus eliminating the time consuming method of manually placing reeding on the coin's edge. 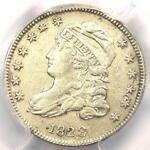 Greatly speeding up production, this also allowed the coins to stack and discouraged counterfeiting. Total design uniformity was not yet realized however, as dies still required hand punching of numbers, letters and stars, and the devices themselves were different from punch to punch. The newly designed equipment allowed the Mint to strike planchets of greater thickness. Adhering to the specifications for coin weight and alloy prescribed by the Mint Act of 1792 required the Mint to maintain the same standards as for the thinner and larger coins previously struck. Therefore, the diameters of the half dime, dime, and quarter as well as the quarter eagle and half eagle were all reduced. Although the proposed reduction in the size of the dime was from 18.8 mm to 18.5 mm, new research shows that actual diameters varied over the years. There is really no consistent distinction between the large and small size diameters, particularly from 1828 through 1834. 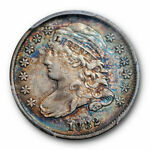 Due to this variance, this type could more properly be called the Close Collar Capped bust dime. The main discernible difference from the previous large size or open collar type are the small radial beads inside a raised border, as opposed to the flat, widely spaced denticles of the earlier production. The new coin was also much thicker at the edges. The Mint's penchant for uniform designs dictated that all United States coins share one of three basic portraits of Liberty: One for copper coins, a second for silver coins and a third for gold. The Capped Bust portrait of Liberty in use when Moore became Director was the one adopted by his father-in-law, the previous Mint Director, Robert Patterson. 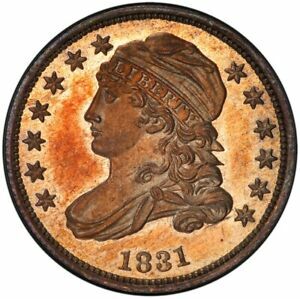 After Patterson hired John Reich as Assistant Engraver in 1807, Reich proceeded to redesign all the coins then in use. The first dime design was Robert Scot's Draped Bust/Small Eagle motif issued in 1796. It was updated in 1798 with a heraldic eagle reverse, primarily in answer to criticism of Scot's "scrawny eagle." Lack of demand, however, caused the Mint to cease production of dimes after June of 1807. Reich's new design for the dime first appeared in 1809 and was later copied by Kneass for the reduced version. 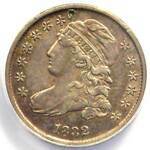 It featured a left facing bust of Liberty wearing a cap, with a diadem bearing the incused inscription LIBERTY. Thirteen stars are arrayed on the sides of the bust, with the date below. The reverse depicts an eagle clutching arrows and branches, with a shield on its breast. Above the eagle are the inscriptions UNITED STATES OF AMERICA and E PLURIBUS UNUM, with the denomination 10 C. below. 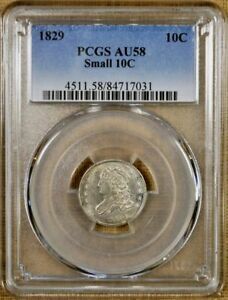 The reduced size Capped Bust dime was introduced in 1828, the same year "Old Hickory," Andrew Jackson, became President. It ended its run after nine years, shortly after excessive speculation had caused the financial Panic of 1837, which resulted in a collapse in real estate, stock and commodity prices. Total mintage during this period was approximately 6,730,000. Small numbers of proofs are known for each year. As with all coins produced at the U.S. Mint during this time, there are some interesting varieties. 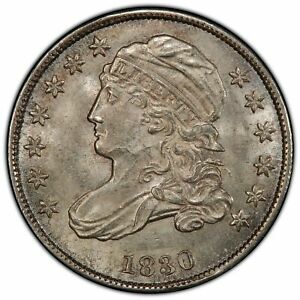 The 1830/29 overdate and 1829 with the curled base `2' are the most notable. Variety collecting today, however, has few adherents. 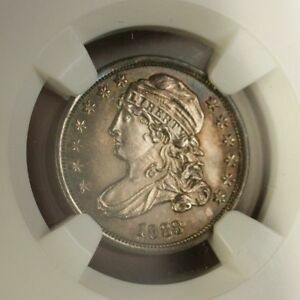 As coins have become more expensive and widely dispersed over the years, there are few collectors assembling date sets of Bust dimes, let alone variety collections. Most choose to own a representative type example. While circulated pieces are readily available for every year, this design type becomes very elusive above Mint State 64. Small numbers of exceptionally well preserved pieces do exist, however, grading as high as MS 67. The toughest dates to find in high grade are 1828 Small Date, 1830/29 and 1837. When grading this design, highpoints on the obverse to check for wear are the drapery at the front of the bust, the hair at the forehead and above the ear and the shoulder clasp. On the reverse, check the eagle's claws, neck and wings. Weak striking is common, and should not be mistaken for wear. Since the first branch mint that produced silver coins was the New Orleans facility which began operations in 1838, all of the dimes of this type were manufactured in Philadelphia. It is notable that the Philadelphia Mint was moved from its original building on Seventh Street to the new building at Chestnut and Juniper in 1833. The total cost of the new building, ground, machinery, and fixtures was $209,230. The original Mint property was then sold in 1835 as two parcels for a total price of $10,100. 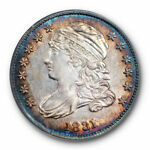 Today, 160 years later, just one or two Capped Bust dimes in gem condition would bring about the same amount. Director Moore was ultimately replaced in 1835 by the person with whom he had originally competed for the appointment, his brother-in-law, Robert Maskell Patterson, son of the former Director, Robert Patterson. The younger Patterson instituted the use of steam powered presses, which greatly increased the efficiency and output of the Mint. Furthermore, he introduced the famous and long lasting Seated Liberty silver coinage designed by Christian Gobrecht, which replaced the Capped Bust dime in 1837. Davis, David J.; Logan, Russell J.; Lovejoy, Allen F.; McCloskey, John W.; Subjack, William L., Early United States Dimes 1796-1837, John Reich Collectors Society, Ypsilanti, MI, 1984. Evans, George G., Illustrated History of the United States Mint, Revised Edition, Philadelphia, 1892. Morris, Richard B., Encyclopedia of American History, 5th Edition, Harper & Row, New York, 1976.